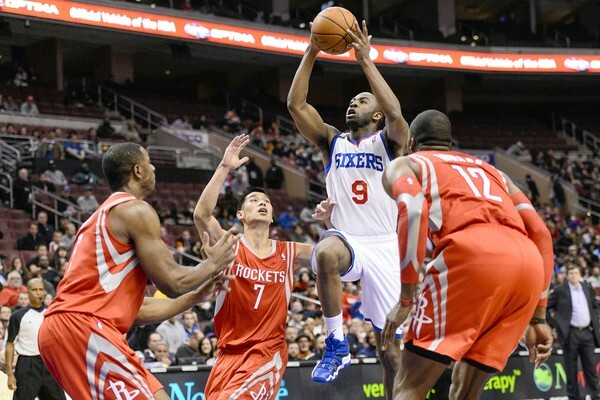 Both Michael Carter-Williams and James Harden didn’t play, but that didn’t stop the Philadelphia 76ers and the Houston Rockets from putting on quite an offensive show, led by James Anderson scoring 36 points and Tony Wroten pulling off a triple double on his first career start. The Sixers won 123-117 in overtime, as Even Turner had his fifth consecutive game with over 20 points, finishing with 23. Tony Wroten got a little bit more attention for his 18-10-11 performance, becoming the first player since the NBA-ABA merger to finish his first career start with a triple double. It won’t stop him from backing up Michael-Carter Willims once the rookie returns from his injury, but the expectations of him will be greater. Anderson was released by the Rockets over the summer, so there was an extra incentive for the shooting guard to pull of a great night, besides making up for the points they were missing from Carter-Williams not being in the lineup. Houston look better on offense with Harden, there’s no denying that. 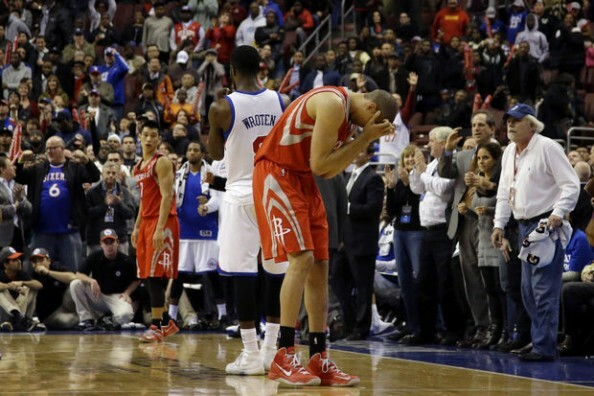 The problem is their awful defense and terrible coaching, with decisions like keeping Omer Asik on the court for only four minutes, as the Rockets, slightly surprisingly, struggle to find any sort of consistency, falling to 5-4, tied with the 76ers, who some refer to as the “Rockets-East” due to their recent approach focusing on statistics and analytics after hiring Sam Hinkie. Everyone said the Sixers phenomenon can’t last for very long, and they have slowed done since the shocking start, but even without Carter-Williams and especially at home, running and gunning against them is a big mistake. The Sixers shot only 41.7% from the field but they forced 19 turnovers on the Rockets (8 to Jeremy Lin), scoring 27 fast break points. Houston, despite Dwight Howard and their ability to stretch the floor, found it very hard to put the ball in the paint when it mattered, focusing too much on shooting from beyond the arc. They finished with 15-of-41, including nine three pointers for Jeremy Lin, finishing with 34 points and showing just how good he can be on offense when there’s no James Harden to get in the way, but Chandler Parsons and Patrick Beverley combined for 2-of-10 from beyond the arc, and Omri Casspi (16 points) was the only player who scored out of the four bench players. Spencer Hawes continues to be a pleasant surprise in the paint. The center finished with 18 points, 9 rebounds, 4 assists, 3 steals and 3 blocks, and is averaging 16 points while bringing down 9.6 rebounds per game this season. The numbers didn’t show the Sixers were better, but Hawes making some key stops on defense near the end made a huge difference in overtime, while the Rockets failed to get any on the other side. The Sixers continue to look like a playoff team according to their record in the jumbled up East, which remains a conference in turmoil when it involves anyone that isn’t the Indiana Pacers. If this kind of basketball, which doesn’t include a lot of defense and is simply about running faster than their opponents, can last for more than a few weeks, maybe all the early season predictions were way off the mark, and it’ll be interesting to see if we see some tanking orders coming down the command chain in order to start resting players out of nowhere. We have no right to have an inherent chemistry or camaraderie. We were thrown together in a few months. But the group trusts each other and enjoys playing together. They have resolve and a fighting spirit. Defensively, we made some great plays, especially in crunch time.